Climb on!, Run for it! On January first my husband Louie and I spent the morning planing the rest of our traveling year. Best laid plans, as the saying goes. We wrote down long vacation or short getaways for each month of the year on the calendar. 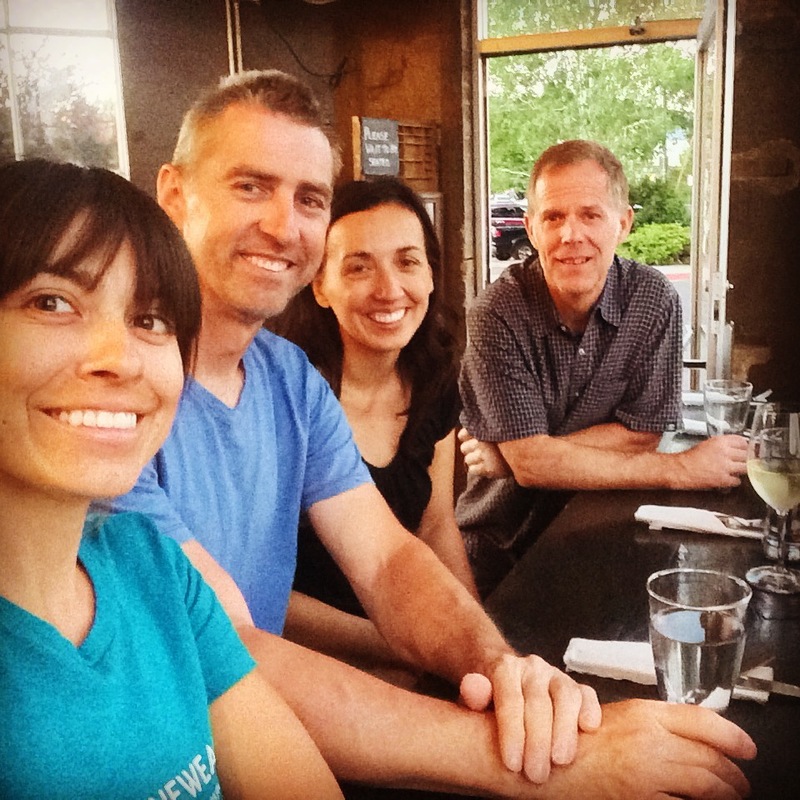 Then we bought plane tickets, reserved hotel rooms, and began thinking about how we were going to train for all that climbing! 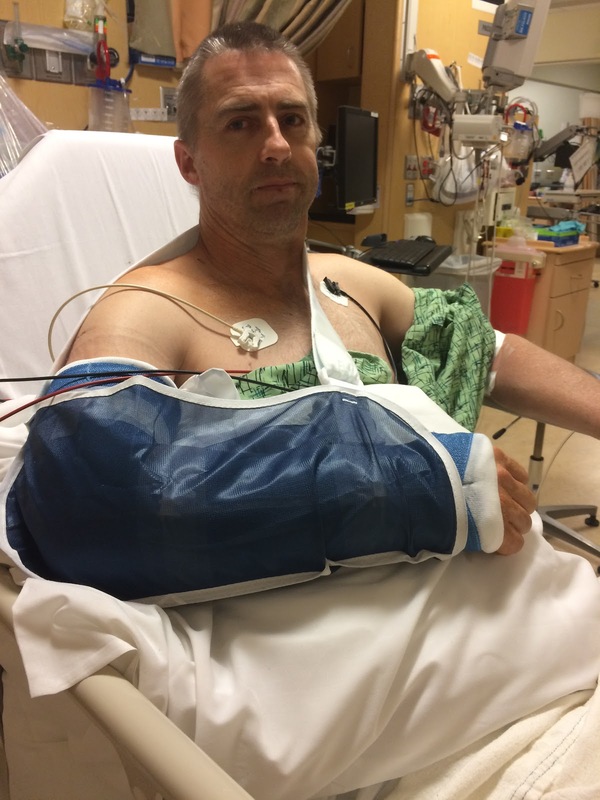 In March Louie fell while working (building another awesome climbing gym for the So Cal community) and broke his right arm. 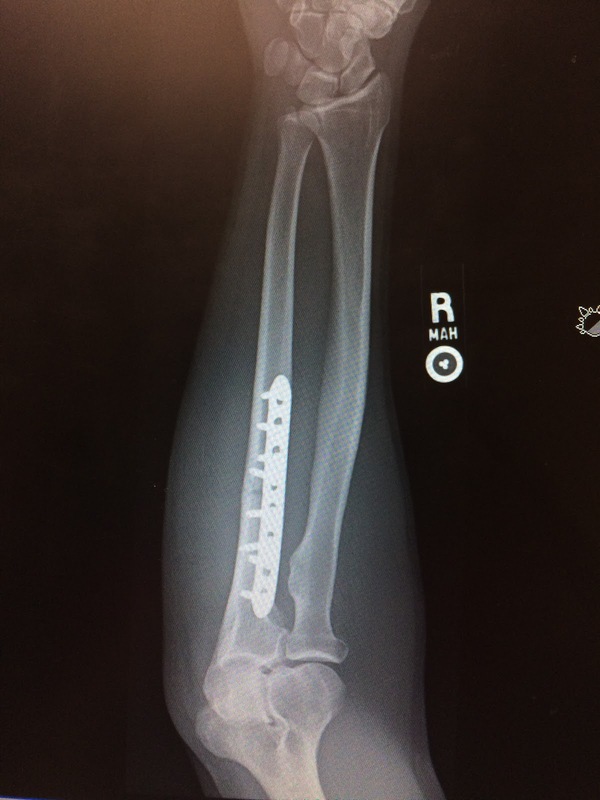 It was a nasty spiral fracture that took 3 hours of surgery to set straight with 4 pins and a rod. We cancelled a few trips and rescheduled our Spain vacation until October. We managed to fill the next few months with work, until finally June came, and we went back out on the road. Our youngest proudly graduated from high school on Thursday, and the next day we loaded the car up at 4am to begin a week long love affair with the road. From Orange County to Provo, we rushed on through three states in one day. 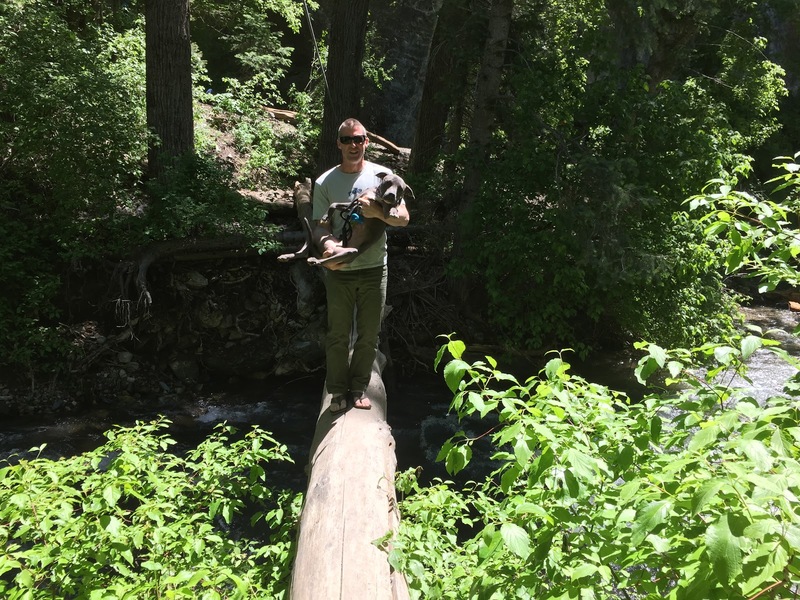 Originally we planned to climb in Maple Canyon for the whole week, but with Louie coming back from his injury we decided to take a more casual and pleasurable approach to this trip. 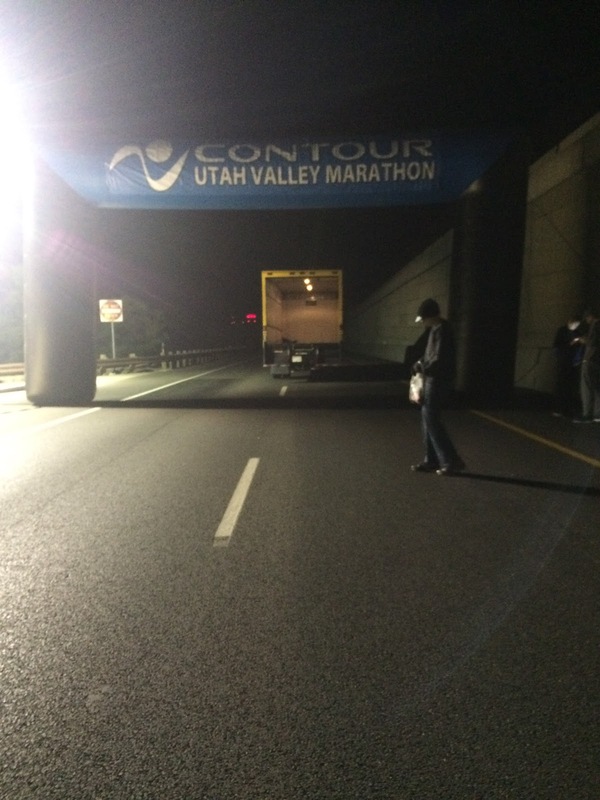 Provo was the first stop because it held the Utah Valley Half Marathon and the K9 Dash. Per my last blog entry, I set a goal to run a race in as many vacation destinations as possible. 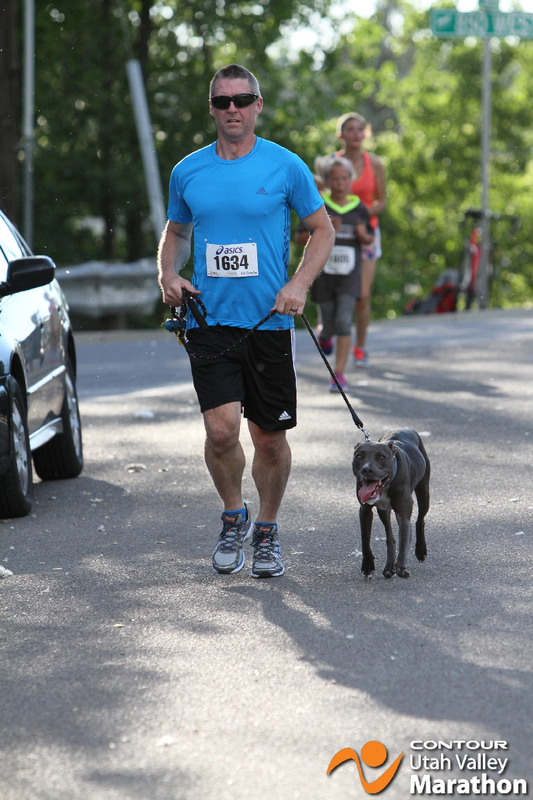 I was really touched when my husband decided to run the 3 mile K9 race with our dog. Running is a passion of mine, and it meant the world to me that not only was he supporting my dreams, but he was also willing to be a part of them. His reward for being an awesome husband? 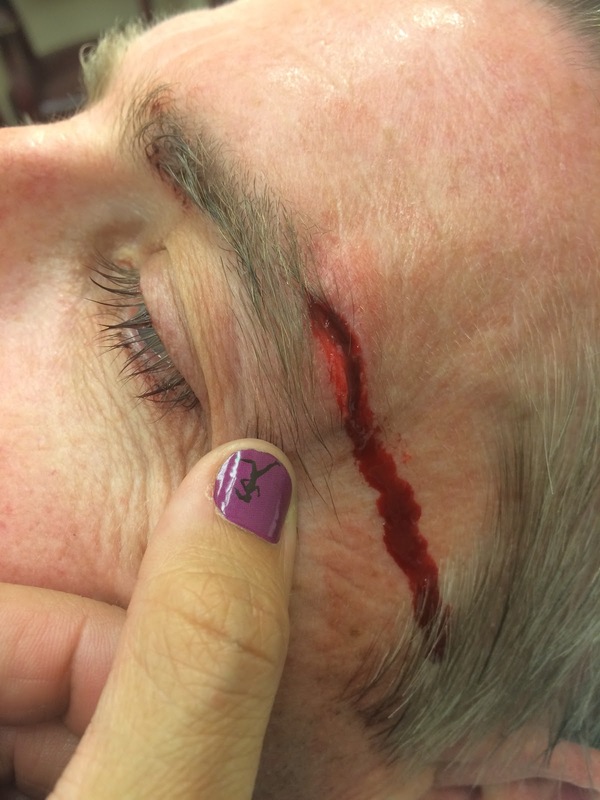 Seven stitches above his left eye. During the race Luna quickly made her competitive way to the front of the pack. Shortly after mile 2 a large dog jumped over it’s home fence and charged after Luna. To protect our fur baby Louie threw the dog off Luna, pinned it to the ground, and as it jolted up to bolt away the beast knocked Louie in the face with it’s hard head. They walked the last mile, with Louie holding his eye and the gushing wound. I just can’t keep this guy safe! 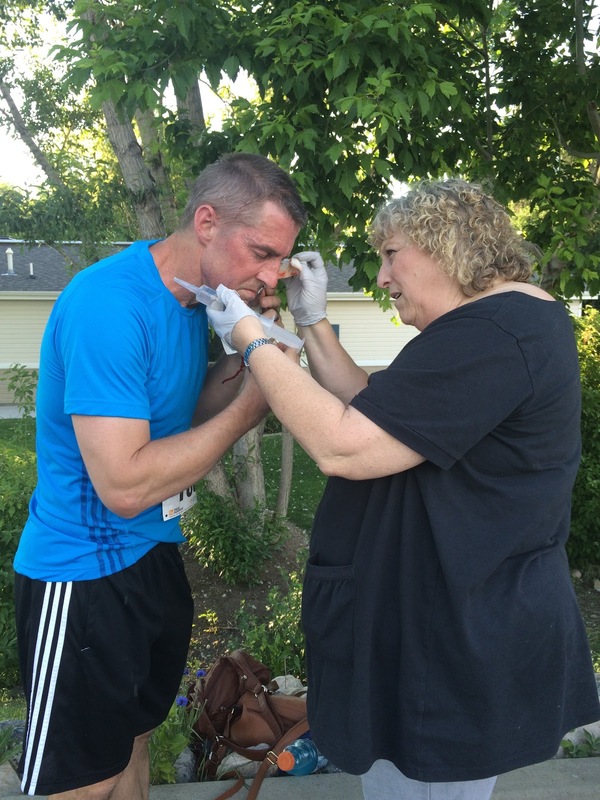 A nurse on staff for the race washed the wound, put a bandage on it, and gave us directions to the nearest open Urgent Care. Seven stitches later and a little food in all our bellies, we were back at the hotel room. I prepared my gear for the 3am wake up and race day. A great run for these two! 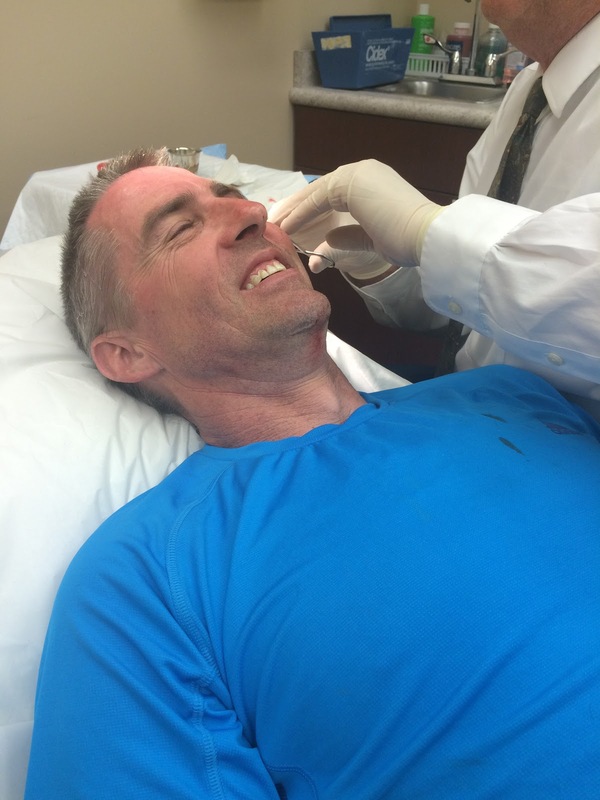 Thank you to the nurse at the finish line for the help! Louie was a good patient while he received his 7 stitches. All set, ready for an early race start! Vibe Shorts sliming, Fuse Tank feminine ruffle. I chose our hotel because it was across the street from the shuttle pick up, and it allowed dogs. 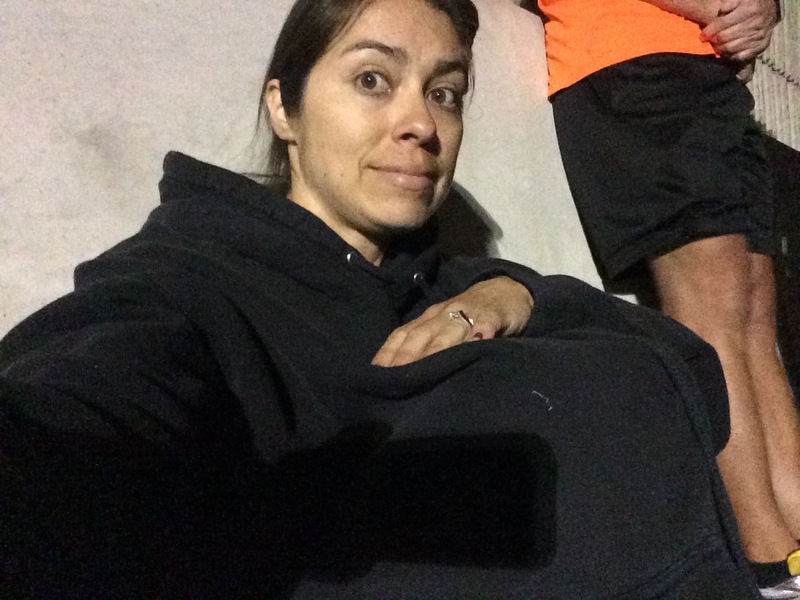 By 4am I was dressed, fed, and waiting in line for my bus to the starting line. 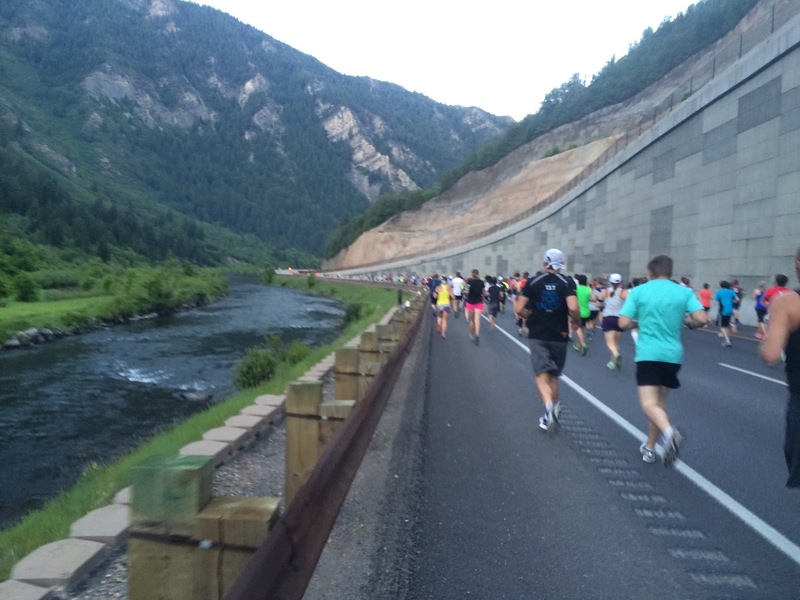 The race began on Provo Canyon road, literally up a canyon. I was not as prepared for the cold as I hoped for, considering it was 90 degrees the day before during Louie’s race. Luck was in my favor as I had picked an old sweater of Louie’s to wear. I curled my legs up inside, tucked my arms in, and tied the hood around my head as I waited an hour for the race to start. With a 20 minute warning I began warming up, drank more water, and used the port-o-potty. Amped, I was ready to go and had a plan. 5am is very dark and cold. 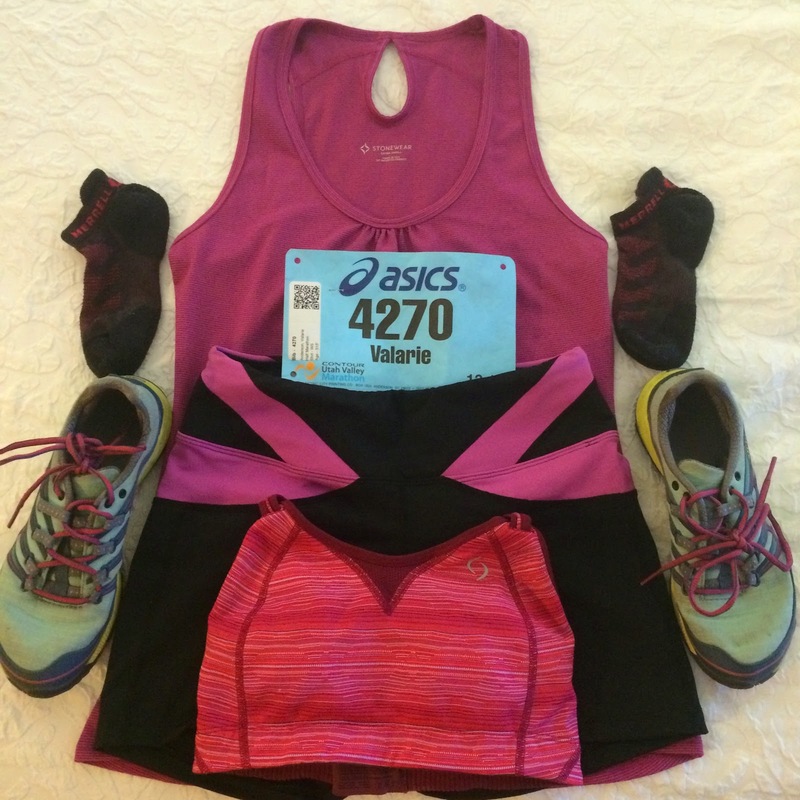 Runners bring sweaters they can ditch and donate. Starting to see light, but still chilly. For the first time, I decided I was not going to follow a pace group. Wedged up in the front I bolted across the starting line when the gun went off. Easing into the race, my first mile was a perfect 9 minutes. I had casually lost my sweater one arm at a time, slowly assimilating with the cool canyon temperature. By mile three I was warm and hitting splits under 9 minutes. Two small hills were quickly defeated and I found myself nearly half way done with the race. The view was so rewarding. The canyon road followed a river all the way back to town. Beautiful trees and clean air waved to me. 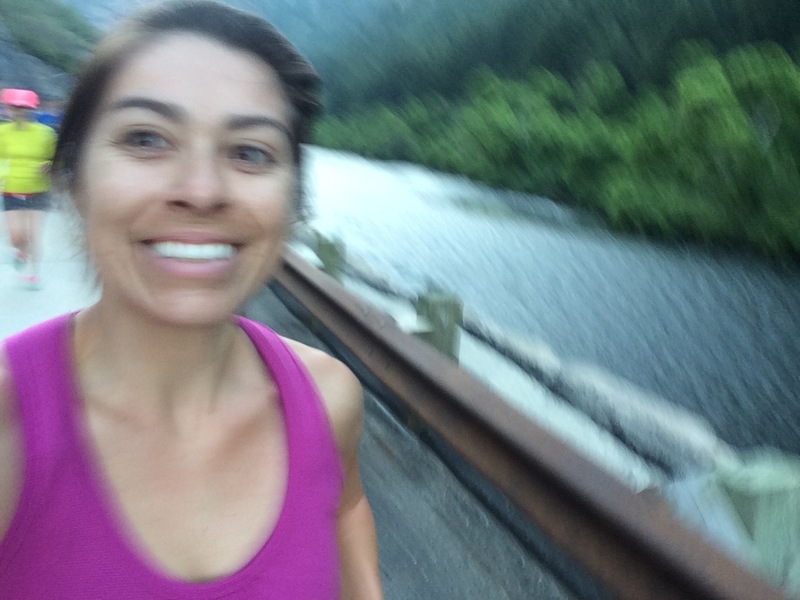 My blurry running photos will never do justice to how breath taking this run was! Wouldn’t even slow down for a better photo… must push on! I started to fall in line with a few other strategic runners. Remembering to eat, I shoved a few energy blocks into my mouth during mile 6 and 7, and guzzled down Gatorade at the mile 8 station. This time I pinched the paper cup, and none went up my nose! My final four miles were a strong push. I couldn’t believe it was almost over, and I was enjoying myself so freakin’ much! My watch beeped my splits, and they came faster and faster each mile: 8:30, 8:24, 8:02. I dug deep. Never had I wanted a sub 8 minute split so badly in my life. 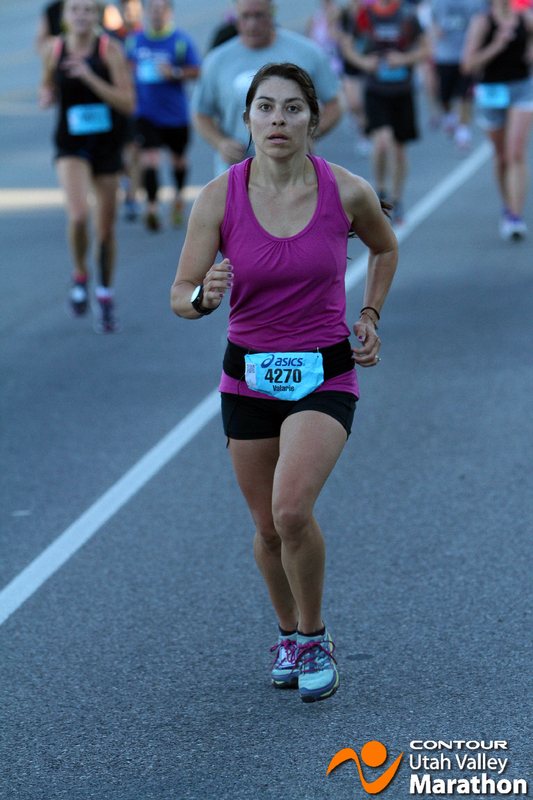 Knowing my training and mental strength would kick in my legs and lungs followed my heart. 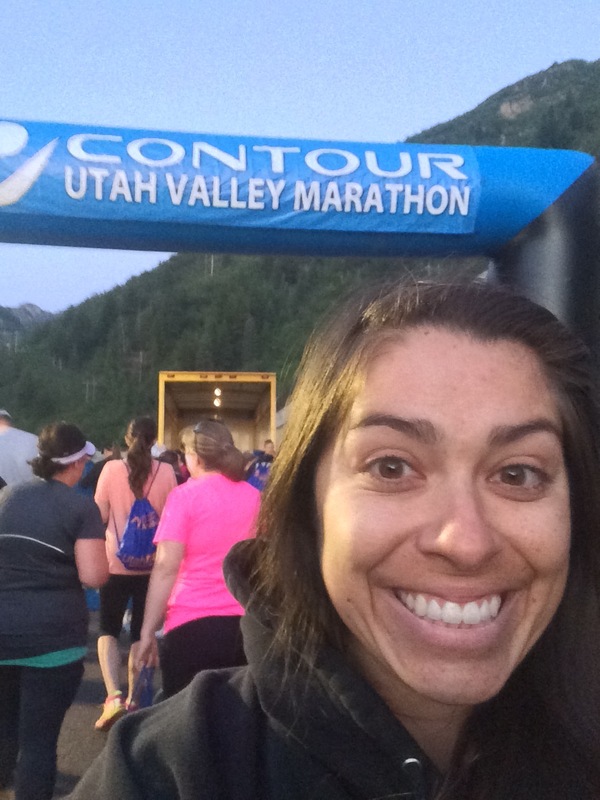 I ignored the last water station at mile 12 and gave everything I had for 1.1 miles! 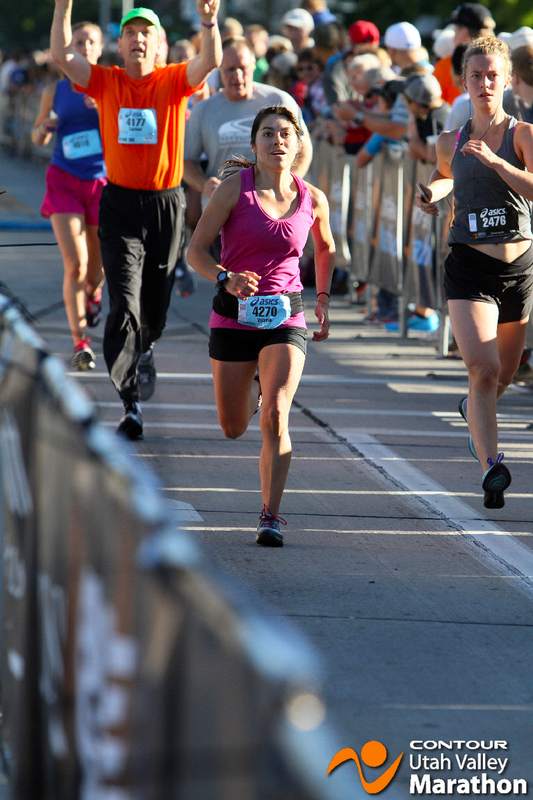 Muscles burned as I sprinted through the finish line, and my pride rushed over me as I realized I had just run my best race ever! Not because I had my best time, but because I ran this one, just for me! My official finishing time was 1:52:46, and I was more than pleased to be under 2 hours by over 7 minutes with a last split of 7:57! Down the road we passed out in a motel room in the little town of Nephi, which is near Maple Canyon, the official reason for our travels. For the first time Luna was allowed on a bed. It took her about 10 minutes of coaxing to convince her that it wasn’t a trick, we sincerely welcomed her onto the mattress. There was a lot of rolling about, and finding the perfect spot (wedged right up against me). Sunday morning we strolled into Maple Canyon, and as expected, it was quite busy. We found the walls and small canyons that did not see regular traffic. Tucked away were a few 5.10 and 5.11 gems we had not been on before. Overall it was a beautiful spring day, filled with cobbled climbing. It’s always a pleasure to be outdoors with my husband and best climbing partner. 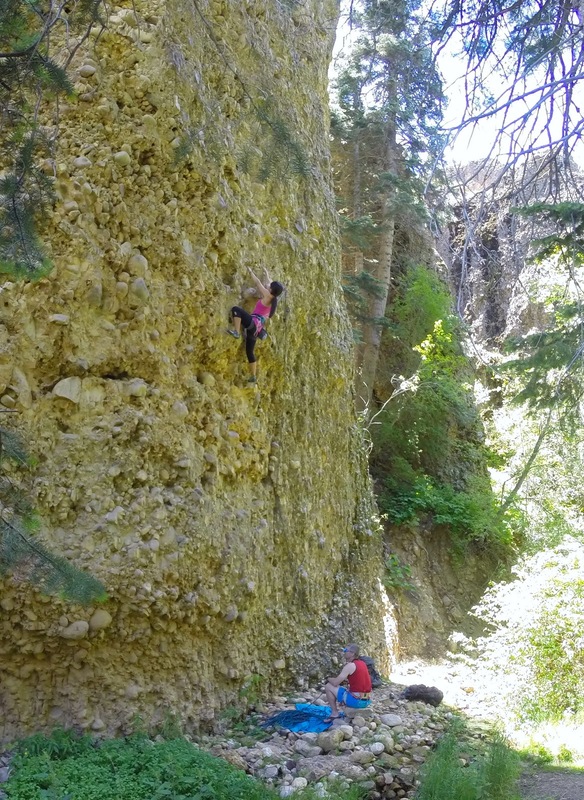 Monday was our second and last day climbing in Maple Canyon. There were very few people left in the area, just a handful of campers. Luna ran about excitedly, chasing bugs and birds. My second greatest joy in life is seeing her run free, uninhibited and natural. She’s quite fast! At the start of the day we were up on a wall that launched from a ledge. 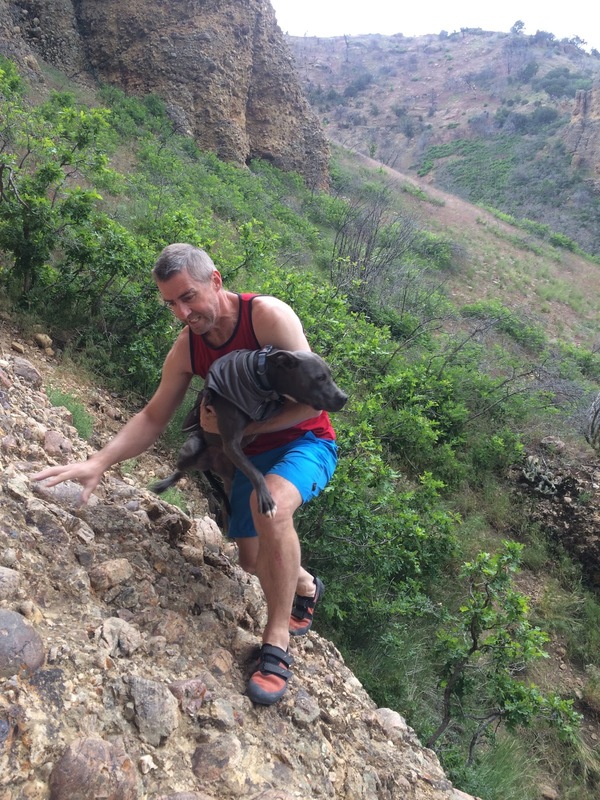 Louie had to port Luna over by carrying her, and then we tied her up to make sure she didn’t managed to trip herself over the short cliff. The 5.10, 5.11, and 5.12 we did on this wall were all stellar. I felt the urge to put my lead head on and roped up for a few 3 star routes. The rain threatened us much earlier than the weather report anticipated, but it moved passed allowing us to climb longer into the afternoon. We ran into several parties we knew, and shared some stories before once again returning to the road. The city of Richfield was our last hotel, and the worst reception ever. However, for $7 a ticket we saw a movie. Tuesday morning we finished the last leg of our trip, and arrived that afternoon in Flagstaff, Arizona. Camp VooDoo greeted us warmly. 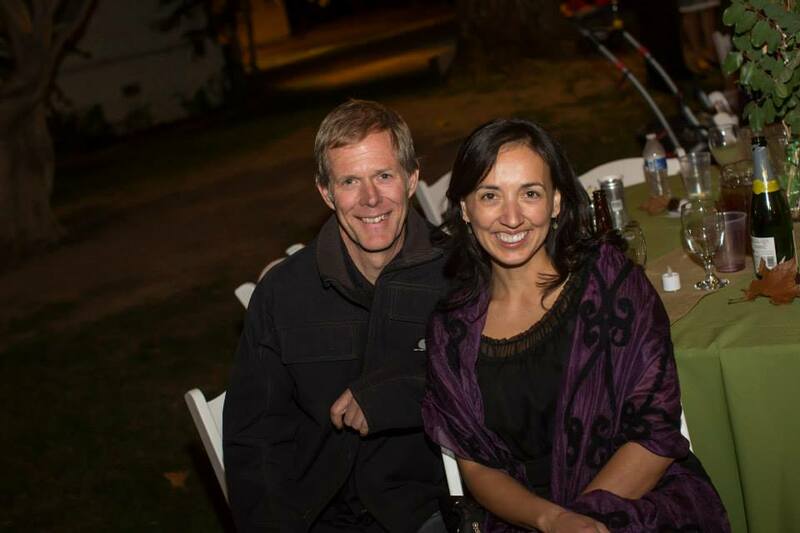 Gina and Frank are long time friends of Louie’s, from when they lived in San Diego and ran VooDoo Climbing Holds from there. 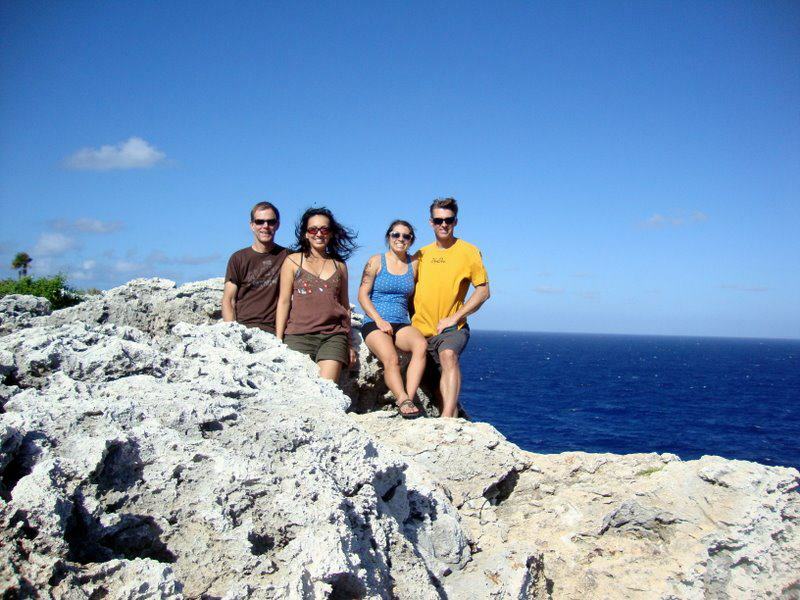 We vacationed with them in the Cayman Islands for climbing, and tried to visit them in Arizona every year. Except the one year where they came to California for our wedding. Gina is the most welcoming, friendly soul you’ll ever meet. Every bone in her body is caring and she giggles her way through every conversation. A true hostess, her food can not be beat! Frank’s a bit more quiet and reserved, but packs a good sense of humor and a shared affinity for cookies. Beyond Frank and Gina’s rural home lies the woods. After a few days of rest from running, I laced up my shoes and hit the trail. Fatigue is real, after a race. The elevation and heat did not help either. There wasn’t a more beautiful place to be and feel miserable at the same time. My aches lay quiet to the sounds and sights of nature all around me. Amazing 5 and 3 mile runs! Cayman Island Trip and our Wedding. Stonewear Design gear: Vibe Shorts with 5″ inseam, Lyra Top with support! 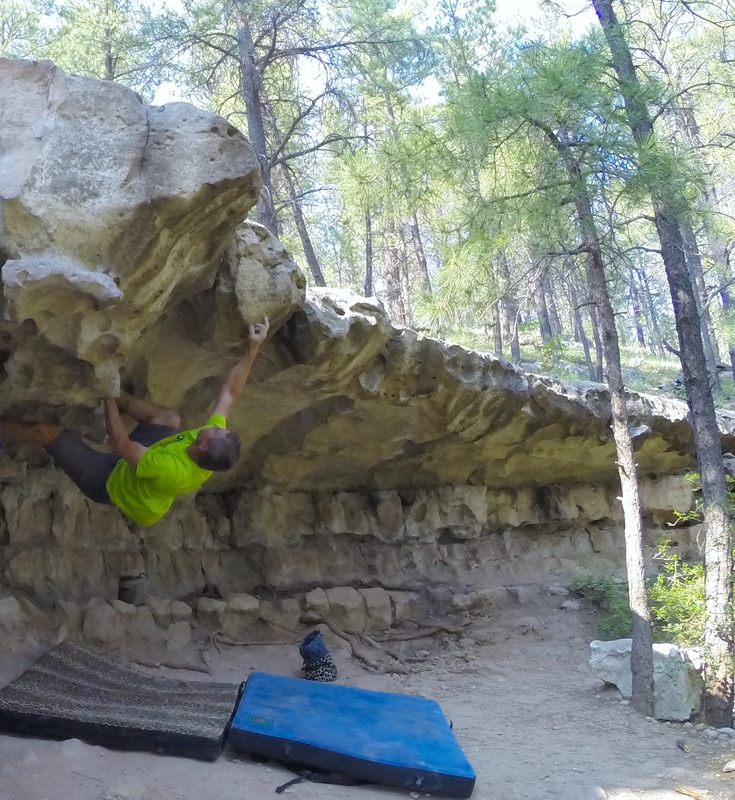 The Priest Draw is Flagstaff’s premier outdoor playground. It’s very easy to get to by car, and the trails lead right up the the rocks. We warmed up on a few classics, and I tried a few new climbs. 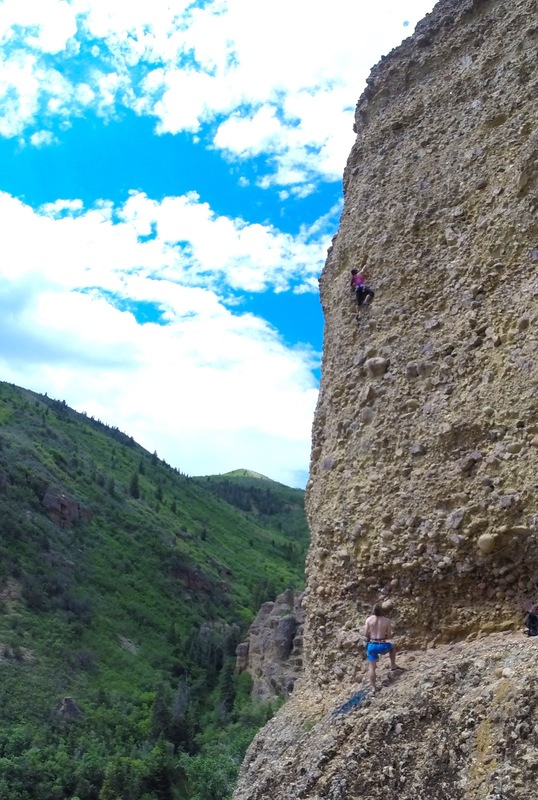 I had to work the beta Louie gave me, but in the end I was successful on another outdoor crag. The Bat Cave, a shelf jutting out at about 90 degrees, escaped my clean send (see the gnarly dab in the video). 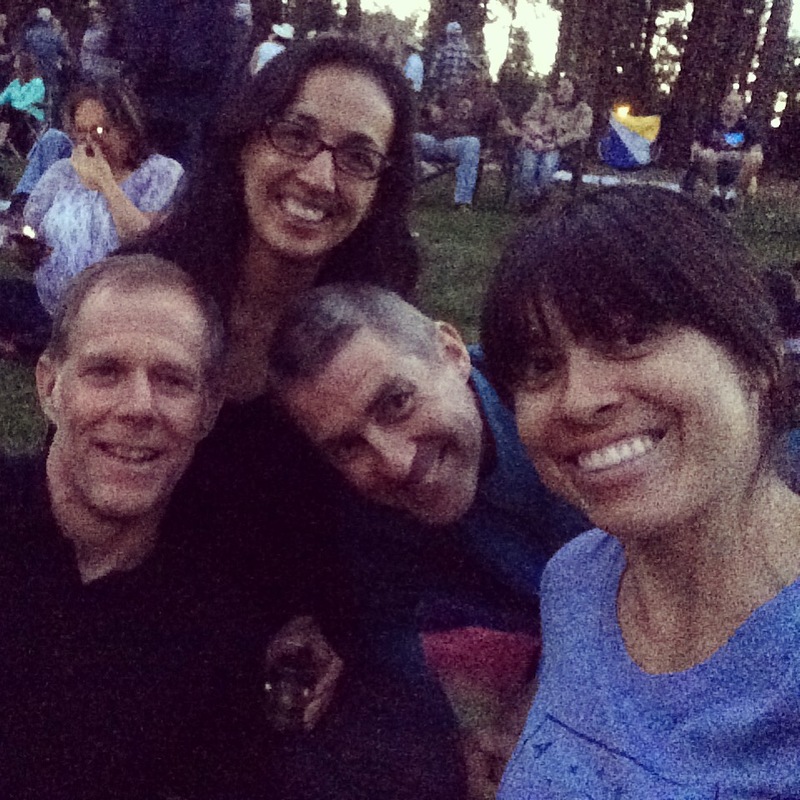 I was grateful to be outdoors with two close friends, and my husband. YouTube video of Priest Draw climbing. 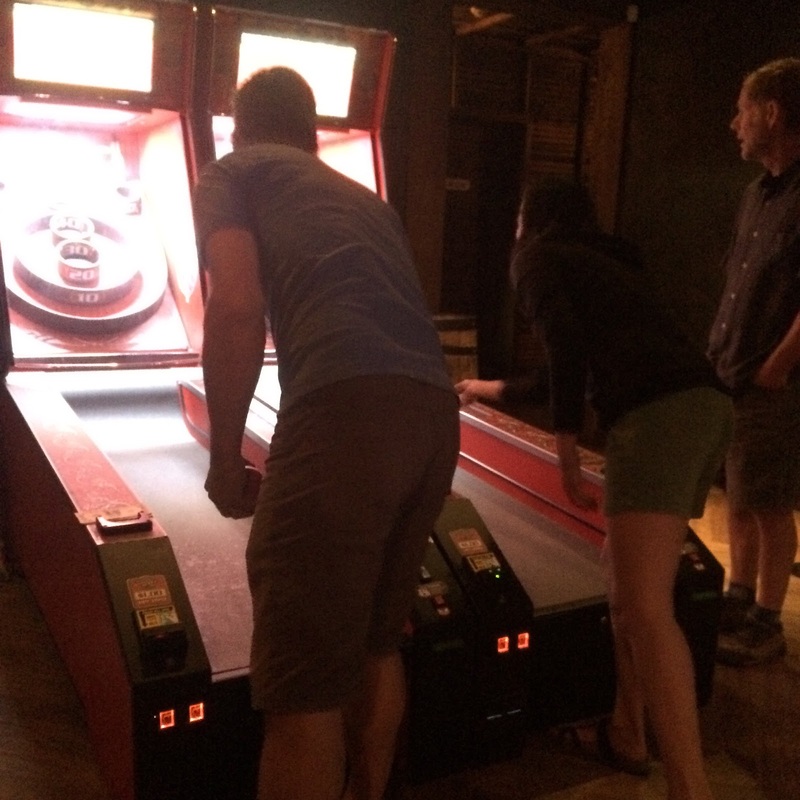 We managed to pack in a concert, a yoga session, happy hour with a live band, a trip downtown for shopping, a day of helping with VooDoo Climbing, pizza with gelato, skeeball in a bar, and an afternoon at the Priest Draw for bouldering. All in just three and a half days! There was also a precarious incident where Luna almost ate Dora the chicken. She went full primal on the hen. I didn’t even know the chicken was in the yard until Luna’s ears perked and her head turned to me, fighting the demons that said “must chase and eat”. She made her choice, and darted for Dora. I managed to catch up with the two as they tangled, and Dora ran free. Gina put her back in the hen house, and I learned my lesson with Luna. Generous! I never leave Camp VooDoo empty handed! Yoga Bag with zip pocket and secure strap. Home was over seven hours away, through the blistering desert with 120 degree temps. Good byes are always tough, as Gina and Frank always make you feel so welcomed and at home. After a week on the road we were ready to be home. July is going to be a blur. Stay tuned for trip reports from Michigan and Mexico. 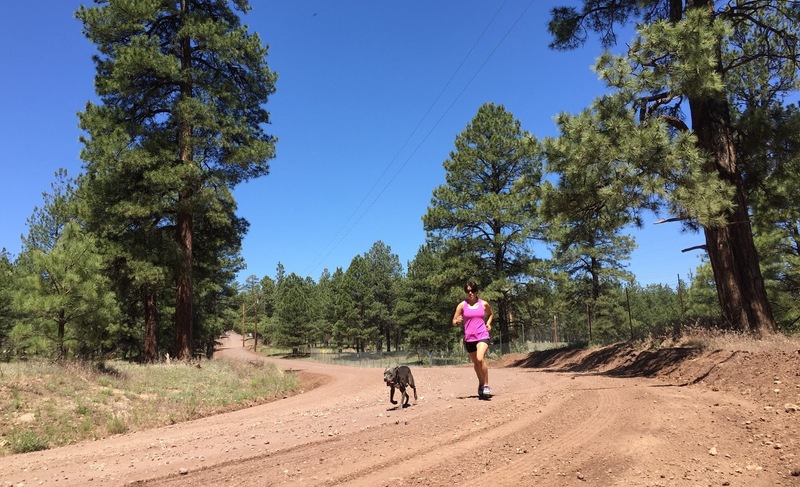 Next Next post: R&R and R: Rest & Relaxation, and Running!